October is approaching it's end and the leaves are finally starting to change around here. It's finally starting to feel like fall! 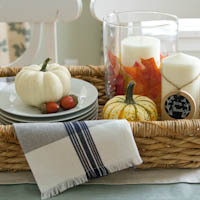 Today, I'm bringing a little of that fall touch to my home. 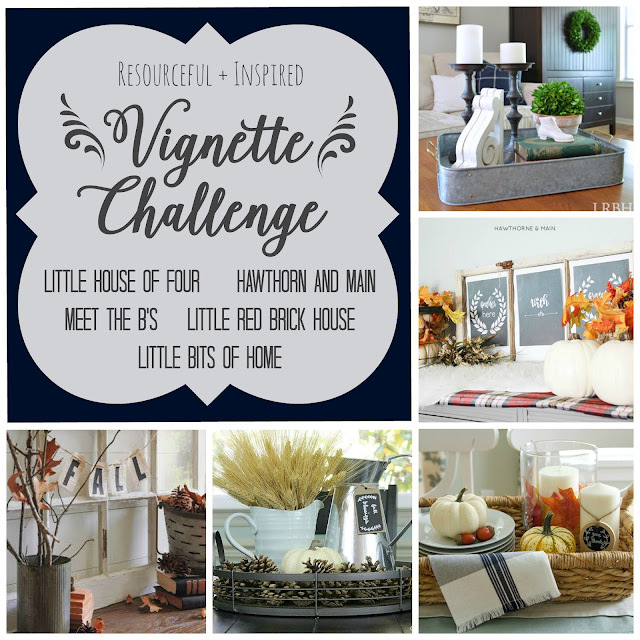 I'm excited to be participating in a fall vignette challenge with some of my blogging friends! 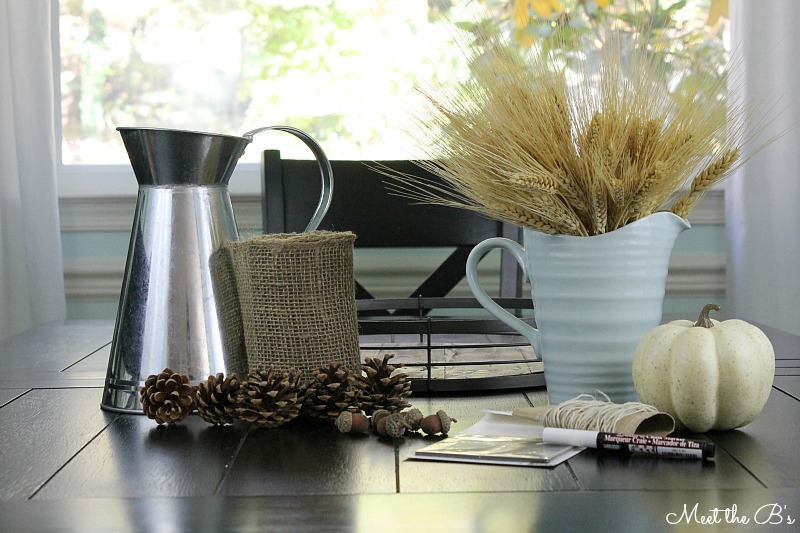 We were given a list of items and were told to use as many as we can to create a vignette. 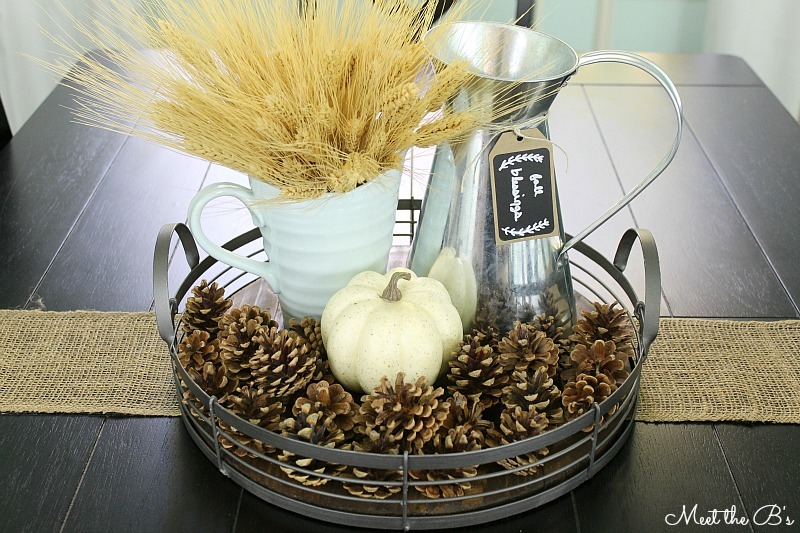 The idea here is to use items you already have laying around the house instead of buying new decor. 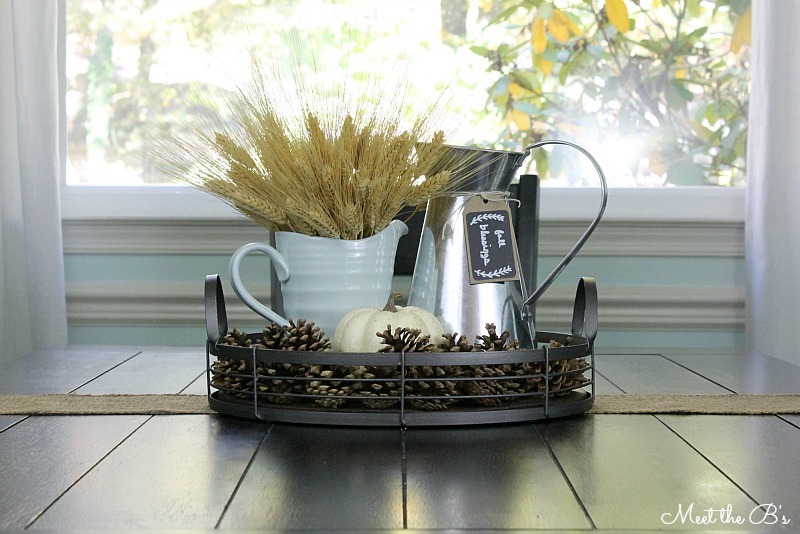 It was fun to take a little walk around my own home for inspiration and grab a few things from different areas to piece together to create the perfect rustic farmhouse vignette! And here's what I actually found laying around my house!!!! 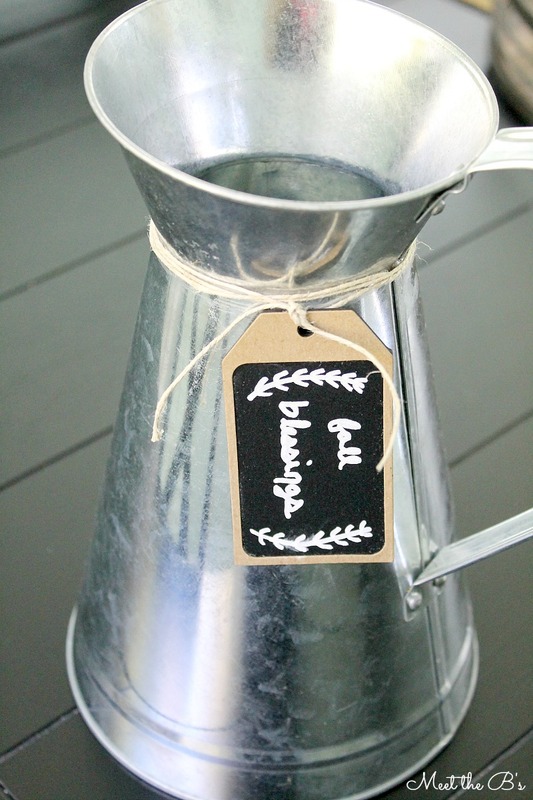 First, to incorporate text, I created a tag for that plain galvanized pitcher. I had some leftover chalkboard gift tags from my spring planters, so I decided to use one of those. I used a chalk marker to freehand the words "fall blessings" onto the tag along with a laurel branch design. (If you're not good at freehanding, you could try my favorite text transfer method instead!) I tied the tag on with some twine which I wrapped around the pitcher multiple times before tying in order to make it stand out more. After that, I just arranged and rearranged my objects until I had a look I was happy with! I rolled the burlap across the table and cut it to fit. I placed the industrial tray centered over the burlap and filled it with all of my goodies. I moved things around until I got it just right. Use some tall objects and some short objects. Vary the shapes and materials. 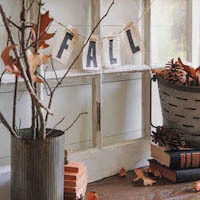 Add some texture using textiles, patterned papers, or natural items. Use an odd number of main objects. Don't be afraid to remove something that isn't working or add more items if needed. In the photo below, I had tried several different placements of the acorns. I ultimately decided I wasn't happy with any of them and removed the acorns from my vignette. I also added more pinecones than the small pile I had originally collected above. 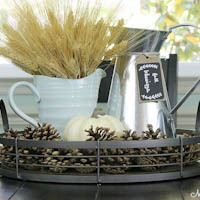 And here is my finished rustic farmhouse fall vignette using items from around our house!!! Want more fall inspiration and tips on creating your own vignettes? 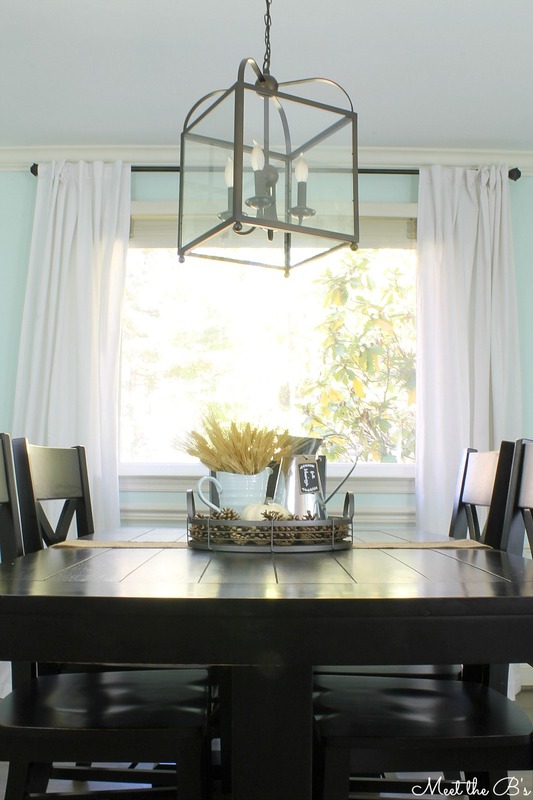 Check out my friends' posts and beautiful vignettes below! Beautiful job, Nicole! 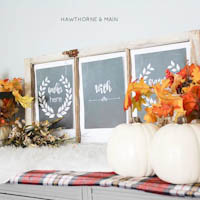 I'm loving the fall theme and all of the natural elements you tied into it. It's simple but packs a pretty punch, just how I like it! Gorgeous! I love how it turned out! Simple is my favorite! Looks awesome Nicole! I love that you used wheat, it has such great texture. I really need to incorporate it more in my fall decor. It looks so good Nicole! I love the neutral colors and the metal tray goes perfect with all natural fall elements.